When you set your sights to the Phi Phi Islands as a diving destination for barracuda, you are headed for some of the most fantastic diving you will ever experience. There are a remarkable number of dive sites that offer colorful and alluring barracuda diving for novice and expert divers alike. The area has several diving centers -- all offering fabulous excursions that include diving in search of the illustrious barracuda. Of the Phi Phi Islands, Koh Phi Phi Don is perhaps the busiest tourist destination with high-end hotels, less expensive bungalows and guesthouses. It is estimated that thousand of tourists from around the world visit daily. Koh Phi Phi Island is set apart because of its phenomenal limestone cliffs that jut up from the sea - in some spots as much as 500 meters. Koh Phi Phi Island is also unique in that it offers a diversity of diving sites in a small area. Because the limestone cliffs rise up from the sea -- underwater they form an interesting environment for divers and sea creatures alike. It is indeed the thrill of a lifetime to behold the caves, overhangs and swim-throughs in this underwater paradise in the Phi Phi Islands. There are caves that have penetrated the underwater cliffs over 100 meters, and they make for exciting barracuda watching with a trained professional diver. Marine life thrives in the area including Cleaner shrimp, Anemone crabs, Bearded Scorpion-fish, Lionfish and brown fish, as well as stunning coral growth that host large orange-colored fans, black coral and sea whips and coral bush covered with oysters and crinoids. Shark Point of the Phi Phi Islands is a protrusion of rocks that slope downward to a field of sand. The diving in this area is spectacular - abundant with marine life including sharks and barracuda. Anemone Reef is not far from Shark Point. The reef is home to hundreds of barracuda and tuna. Garang Heng is a submerged reef in the Phi Phi Islands that lies two kilometers east of Phi Phi Leh. There you will find large schools of yellowtail barracuda, twin-spotted perch, gold striped fusiliers and blue-lined snapper. Koh Bida Nok and Koh Bida Nai are both small formations made of limestone and known as two of the best scuba diving sites on the Phi Phi Island. 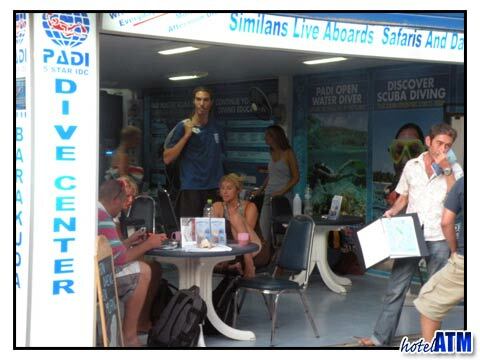 Perfect for deep dives, drift dives and wall dives they serve both first time and experienced divers well. Divers find beautiful sea fans and soft corals in the area, as well as sea horses, shrimp, pipe fish, nudibranchs and an occasional grey bamboo shark or barracuda. Off to the east a bit, there are large fields of staghorn corals with enormous barrel sponges growing. There are also bamboo sharks homing under rocks and leopard sharks napping on the sand near the reef. Divers often run into schools of barracuda in this area as well. 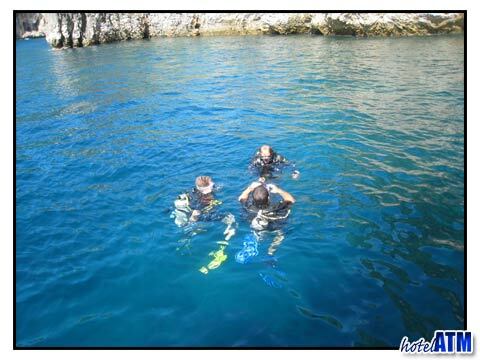 Scuba diving in the Phi Phi Islands: Phi Phi Barakuda Diving Center offers daytrips, Liveaboards and PADI courses.